Clearly, the recent cascade of disasters in Japan will have a protracted recovery. According to a CNN article, Japan faces lengthy recovery from Fukushima accident, April 22, 2011. The worst may have passed in the most serious nuclear accident since Chernobyl, but cleaning up when it’s finally over is likely to take decades and cost Japan an untold fortune. A six- to nine-month horizon for winding down the crisis, laid out by plant owner Tokyo Electric Power this week, is justthe beginning. Near the end of that timeline, Japan’s government says it will decide when — or whether — the nearly80,000 people who were told to flee their homes in the early days of the disaster can return. 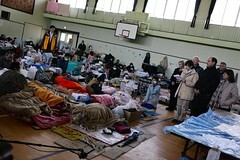 Friday marks six weeks since the March 11 magnitude-9.0 earthquake and subsequent tsunami that triggered the crisis. Some of those who have already spent six weeks in emergency housing … say they don’t expect to return to what was home. Another article with the same theme was published by Reuters on April 24, with some details about the preliminary blueprint being used for recovery planning. This entry was posted in Japan, Redevelopment by recoverydiva. Bookmark the permalink.